Throughout the year, if you enjoy cooking, you will find yourself relying more or less on staples from the store cupboard, according to what is in season at the time. It is in autumn and winter, when there is less choice of in-season foods in the greengrocer's, that preserved ingredients, whether pickled, bottled, frozen or dried, come into their own. Many seasonal ingredients can be successfully dried so that you can enjoy them at a later date. With some foods, drying can alter the flavour, but not necessarily in a bad way; and there are ingredients that are particularly well suited to drying, including mushrooms, chillies and herbs. 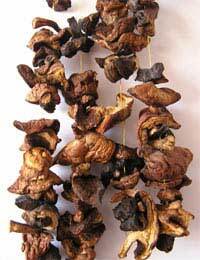 Wild mushrooms are prized by foodies and, because of their short seasons, are a good choice for drying. Ceps (or porcini), chanterelles and morels can be dried then rehydrated by soaking them in warm water for about 30 minutes before cooking. In the case of mushrooms, drying intensifies the taste and only a few dried, wild mushrooms added to a risotto or stew made with the more common cultivated mushrooms will give a real boost of flavour. Drying mushrooms is a simple process. They should be sliced, arranged flat on a tray in a single layer and left in a warm place - like the top of an airing cupboard - for several days until dry. Then store them in an airtight container until ready to use. Drying is an excellent way to preserve fresh chillies. More and more people are growing their own chillies now, even in pots on a warm, sunny balcony, and drying them can extend the season for your home-grown harvest. Again they should be spread out on a tray, in a single layer, and left in a warm place for several days to dry. Store them in an airtight container until ready to use. Dried chillies are good used whole, or crumbled into dishes or, like mushrooms, they can be rehydrated before use by placing them in warm water for 30 minutes or so. It has to be said that when you have more fresh herbs than you can use, freezing them does retain much more of their flavour than other forms of preserving. But drying is also a good method and it extends their use until much later. The bonus, too, is that home-dried herbs usually have a better flavour than the commercially dried ones available in the shops. As before, you should spread the leaves out flat on a tray, in a single layer, and leave in a warm place for several days until dry. Store in an airtight container until ready to use. The more delicate, tender herbs such as basil, parsley or coriander offer a more authentic flavour out-of-season if they are frozen, but, if you can, it is worth also drying them when they are plentiful. Hardier herbs, such as rosemary, thyme, chives, sage and mint are very easy to grow and usually provide a good crop, leaving plenty for drying. Remember when using dried herbs that one tablespoon of chopped, dried herbs will taste as strong as two tablespoons of fresh herbs. The essential oils in dried herbs are concentrated and as a result their effect on a dish is often surprising. If you have had your dried herbs for some time, check that they do not smell musty and that they still have good strong colour. Parsley, for example, should be bright green. Some herbs, such as rosemary, are naturally greyish when dried. Rub some of the dried herb between thumb and forefinger to test that the essential oils are still strong. Any such problems should be avoided if you store dried ingredients properly. Store them in a dark cupboard or corner of the work top, preferably in airtight glass or earthenware containers.